Thanks to fellow cat pal Farida, our Boris is off to a new home today. He's going to live with a retired teacher who wants a cat to sit on her lap while she watches TV, and to sleep on her bed at night. Boris is going to ADORE this woman. Since he got "the snip" ten days ago, Boris has stopped marking our gate, door etc. He's been in and out of the house (much to Target's absolute horror!) and has not marked indoors either. All good news. Don't you just loooove happy endings? Monday Writers Craft Online: The Editor: Foe or Friend? However, when I write for a publication, my work is always subbed/edited. Some writers really object to having their work edited; I think it's an excellent thing. OK, if you're unlucky enough to get a bozo going over your work, then they can ruin you. I remember years ago someone at the NST "improving" my work by adding in split infinitives, subject-verb errors, and other grammar horrors. When the piece was published it sounded like something you'd hear at the wet market. I suggested to the editor back then that she take a look at the "improvements" before letting them through. As it turned out, she'd already seen the piece, checked whose errors they were, and removed that sub. For the most, however, I find that editors improve my work. When I write something, I tend to become blind to errors and glitches. Editors can cast a fresh eye on work and then pick up errors or smooth out style problems. Eric Forbes of MPH picked out over a dozen grammar errors in the Logomania manuscript; Howe Leng of Marshall Cavendish did the same with Katz Tales. Magazine eds like Margaret Sebastian and Tara Barker can swap around a few paras, add in some sub headings and turn an OK article into a winning feature. If you ask me, I'd say editors are a writer's second-best friend. 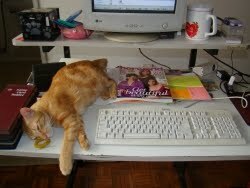 Cats are of course the writer's best friend - but you knew that, right? Boris is out in the print version of Weekender, the Star's Saturday supplement today. For those of you who are interested in reading up more on neutering tomcats, check out these resources. For a quick Q&A about what happens during neutering, and how if affects your kitty, check out Pawprints. For cheap neutering clinics, ask Klinik Kembiri in Selangor, or call your local SPCA for a list of place near you. I don't have all the numbers but you can try calling this list to ask for info. Effects of castration on fighting, roaming, and urine spraying in adult male cats. This study demonstrates that cats that are castrated as an adult decrease their urine marking behavior just as significantly as those that are castrated to prevent problem behaviors. The problematic behavior can decrease quickly or slowly, and there is no way to tell if your cat will be in the 'quick' category. I can't find the original paper online anywhere, but there is this followup that is excellent! There Are Too Many Unwanted Kittens. Don't Litter, Neuter! 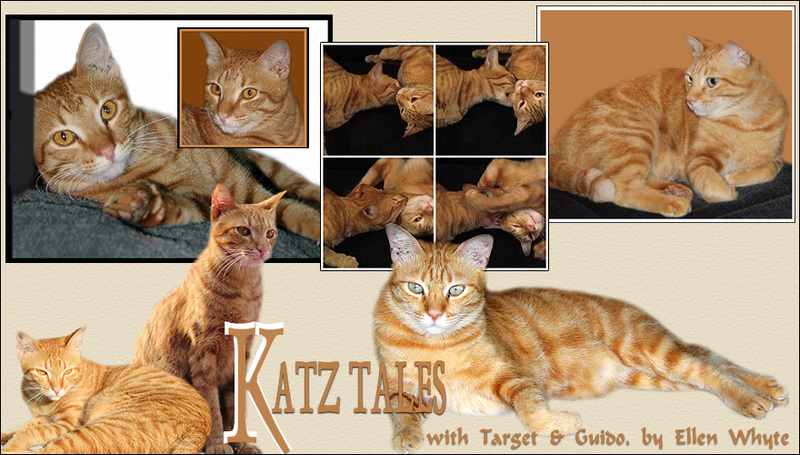 Katz Tales is out in The Star, Weekender, print version only tomorrow. Get your copy while it's hot! It's boiling hot in Malaysia - some 38C and sticky to boot. Nasty. The cats spend most of their time floating upside down underneath the fans, but at night they're wrestling. Pity we missed the cat-o-lympics!